The 21st century is all about technology, technology, and technology. In this tech savvy world, we always come up with ways that ease out our day to day activities. Learning Management System is one such invention that technology has brought in. We, humans, are always surrounded by choices, hence it becomes necessary to streamline our requirements to make the best choice. 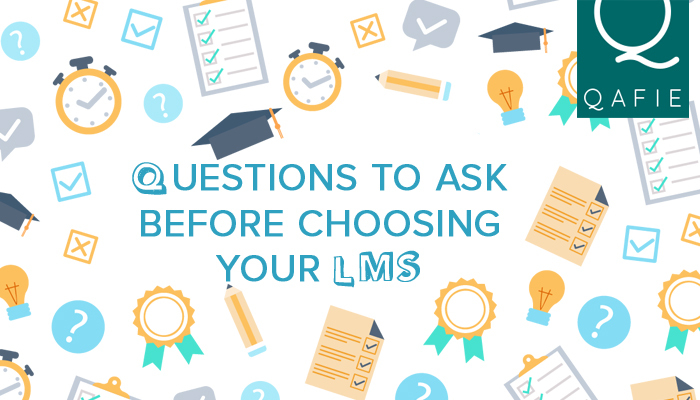 Before you go in with an LMS, it is necessary to shoot in some questions to the representative so that you end up with a lucrative product, that is without an air of doubt or concern. So, what are those questions? Let us take a look at them. 1. Will you give a demo of the LMS? If you are a first-time implementer of the LMS then you would be having lesser expectations. If you already have an experience of using an LMS then you know exactly what to look for and what to expect. 2. What is the USP of the product? There are many Learning Matrix Systems in the market that promises to give something new and distinct. Find out what it is that separates this LMS from the remaining eLearning systems available in the market. 3. How secure is the LMS? With an ocean of data that would be fed into the application, it becomes necessary to test its security features as you cannot afford to lose data that is confidential in nature. 4. How long will it take to be implemented? Implementing and executing a software application does require time and patience. Find out the time that would be taken to imbibe the application and how complex is the process. 5. How easy it is to be used? An LMS that is amicable in nature is often appreciated and the most preferred ones. Look for those LMS's which is not only easy to understand but also easy to use. 6. Does it encourage social networking? Social connection has been extremely important in today's world. An LMS that enhances sharing through various social media platforms would be adorable to implement. 7. What are the highlights of the project? What are the fascinating features of the product? Study about the features that the LMS would be exhibiting and at the same time lay down your requirements. Make a comparison for better decision making process. 8. To what extent will you provide technical assistance? Does it have an IT team that works to solve the problems that this LMS might exhibit at any given point in the future? Find out about the team that will be there for your technical assistance for the post and pre-technical services. 9. What are your LMS standards? The market has three of the famous protocols that you wish your LMS to be. AICC, SCORM, and Tin Can are the most preferred standards when it comes to LMS. A SCORM compliance widens your opportunity to spread your wings as it is not limited to devices. Make sure that the LMS can be accessed across all possible device and across all possible platforms. Cost is one of the most influential factors that decides whether the product should be purchased or not. Have an idea as to how much you are ready to shell out for an LMS and accordingly put down your price. Conclusion: There is nothing wrong in asking questions as it just clears the air of doubt that is being accumulated in our minds. Go ahead, clear your doubts, pen down your thoughts and then come to a final conclusion which would be free from regrets and wrong choices. A Google Analytics Certified Professional handles the position of Sr. SEO Manager atTechno Infonet. He has expertise in SEO, Social Media, Digital Marketing, Google Adwords, Google Analytics and so on.